"Booth after booth, month after month...handcrafted items; organic items; unique gifts...a hodge podge of great local, small businesses and artists...all under one roof. Free bounce house for the kids!!!" Admission is just $5 per person or $3 per person and 2 cans of unexpired food for the Golden Food Pantry. Kids 12 and under are free w/paid adult. 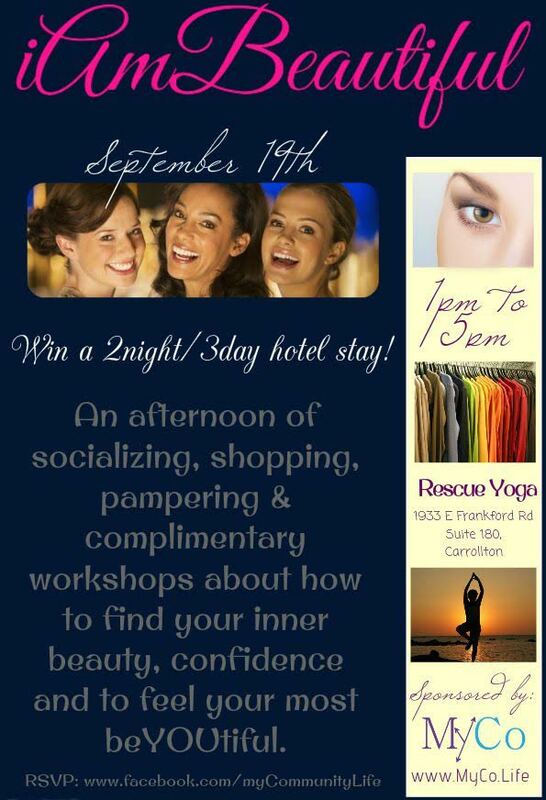 "Join us for an afternoon of socializing, shopping and complimentary workshops about how to find your inner beauty, confidence and to feel beYOUtiful in your skin. There will be 7 free workshops to select from and they will begin promptly at 1:15pm so don't miss out! Bring your girlfriends, sister, mom, and BFF and enjoy the offerings of al the shops. This is a non-pressure shopping event." At the corner of Frankford and Josey Lane near Walgreens. Live workshop/demo $10 for 30 minutes. "Outdoor craft fair 9 a.m. to 4 p.m. at Finish Line campgrounds on September 19th, 2015. Come visit our first ever Craft and Vendor fair. The address 3200 Petty Place. Just off of FM 156 the back entrance of TX Motor Speedway." "The City of Grand Prairie Parks, Arts and Recreation Department is hosting the 3rd Annual Flight of the Monarch Celebration, scheduled for September 19, 2015 at Central Park Boardwalk and surrounding areas. Along with our selected performers, this FREE festival will celebrate the fun, festive, family atmosphere of Grand Prairie with LIVE! music and a headlining performance by four time Grammy nominee Trout Fishing in America, Butterfly Releases, Kite Flying, Local Entertainment, Bumper Boats, Arts & Crafts, Food, a KID ZONE and so much more!" "Wives of doctors from across the country will gather at the LDW get together event on 9/17-9/19 in Dallas. We will have a short vendor fair on 9/19 for vendors who can offer unique products to our members. " "North Texas MADE and Etsy Fort Worth are teaming up with Fixture to bring you another awesome indie show with makers from all over North Texas! Enjoy brunch, cocktails and shopping with local, handmade artists." "We are holding an event that we are calling Smiles 4 Our Military and we will be raising money and collecting items for care packages to be sent to the soldiers overseas. We will be working with the USO, National Guard, Army, Navy, Air Force, Coast Guard and Marines. We will raising money and collecting items for care packages for 1 unit per military division. Our guests will also have the chance to adopt a soldier. "